“Oh youth, guided by the servant of the goddess, unite earth and sky, and bring light to the land.” So foretell the lyrics of the melody that Zelda sings during the opening of The Legend of Zelda: Skyward Sword, and so becomes the premise of the spectacular rollercoaster of an adventure that follows. Your quest begins atop the floating isle of Skyloft high above the clouds, amidst Link’s preparations for a bird-flying competition – the victor of which earns the honour of taking part in the Wing Ceremony alongside Zelda, who Link has shared a special bond with since childhood. 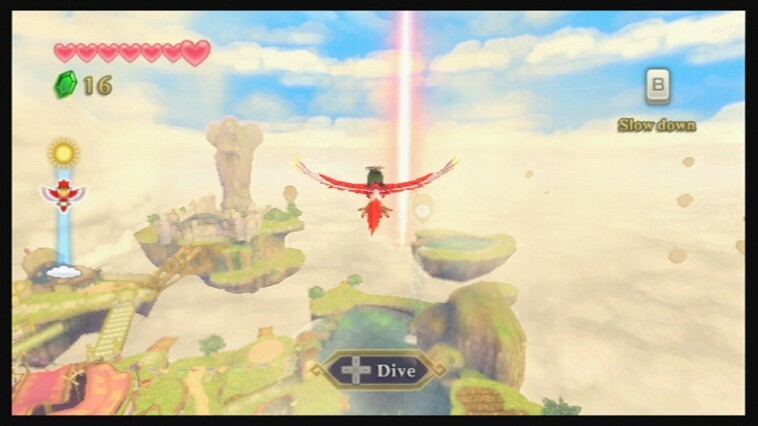 However rival Groose stirs things up by hiding your rare, prized red Loftwing – majestic birds that are bestowed upon villagers of Skyloft at birth and are used to traverse the skies – and Link’s initial objective is to seek the aid of the locals to gather information as to where it may be hidden, so that he is able to enter the competition. Having located his troubled bird, Link unsurprisingly enters and wins the competition, resulting in him partaking in the Wing Ceremony with Zelda, receiving a gift of a Sailcloth from her for his efforts. A successful day then, that is until Zelda is pulled from her Loftwing by a dark whirlwind and tumbles to the mysterious lands below that no one has ever visited. It is here that Link’s true destiny is unravelled as he follows the calls of Fi, the spirit of the powerful Goddess Sword who is more robotic than spiritual in nature, who reveals that he is the chosen hero of the goddess and must set out on a quest that will ultimately see him create the Master Sword and seal way a malevolent evil known as The Imprisoned from the lands for good. 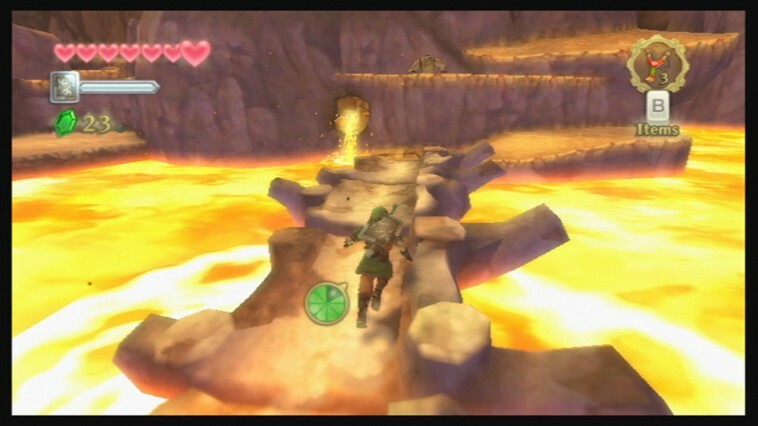 Naturally, this opening section acts as both a narrative prologue to the course of the game, as well as a tutorial for players to become accustomed to the control scheme and Link’s new abilities. Even present from the opening scenes, Nintendo has made a concerted emphasis on character development this time around, with Zelda, in particular, playing a more prominent role aside from her previous damsel in distress vocation. Her relationship with Link is continually explored throughout the entirety of the game, which in places is quite heartfelt. Fi, stored within the hilt of the Goddess Sword, also proves to be a worthy travel companion and far less intrusive than the now infamous Navi. Players may address her at any time, in which she expels herself from your hilt to aid you with advice on where to go next, to provide information on rumours for you to pursue sidequests, or even to provide a summary of what just previously happened within the central plot. As can be expected from Nintendo, you can expect to meet a number of quirky NPC characters at every turn each with their own personalities and exuberant expressions. You will also be barraged with numerous sidequests that serve to distract you with fun, simplistic objectives, the majority of which often have a humorous twist to them. Batreaux was a personal favourite, but others may see you searching for a new Crystal Ball for the Fortune Teller, for instance. New races also appear, including the Kikwi and Parella Tribe, and old favourites such as the Gorons and mysterious Sheikah also return. Zelda fans keen to learn more regarding the lore of the series are certainly in for a treat. The Legend of Zelda: Skyward Sword‘s aesthetic is a visually sumptuous and diverse colour palette that suitably masks the technical limitations of the increasingly dated Wii hardware. Traversing the expansive overworld on your Loftwing is breathtaking in itself, with clear blue skies interspersed by suspended land masses that offer numerous locations to explore outside from the main storyline. Yet it is when the player is able to gleefully skydive to the lands beneath the clouds that you will become astounded by the range of locales. The underworld, as it is perhaps easiest to call it, comprises of three distinct regions – Faron Woods, Lanayru Desert and Eldin Volcano – that are themselves broken into multiple areas that are opened up at specific points within the game. An eclectic mix in dungeon design is also evident, those within the Lanayru Desert proving to be the biggest highlights through their use of Timeshift Stones which are probably best seen for yourself than explained here. Their use evoked memories of the moment in The Wind Waker where Link once again returns colour to the submerged Hyrule Castle. Puzzles themselves are also challenging in places, but never too difficult to the point where players will find themselves driven to despair. Boss Key’s have also received a twist, now being 3D pieces that must be rotated and turned so that their shape matches that of the lock. Bosses themselves are well varied, again causing the player to think outside the box in terms of approach to use a range of items and weapons at their disposal. Whilst perhaps not as challenging as they could be, the variance in design is to be commended, and there are a few spectacular fights that are sure to keep those playing the game on their toes. 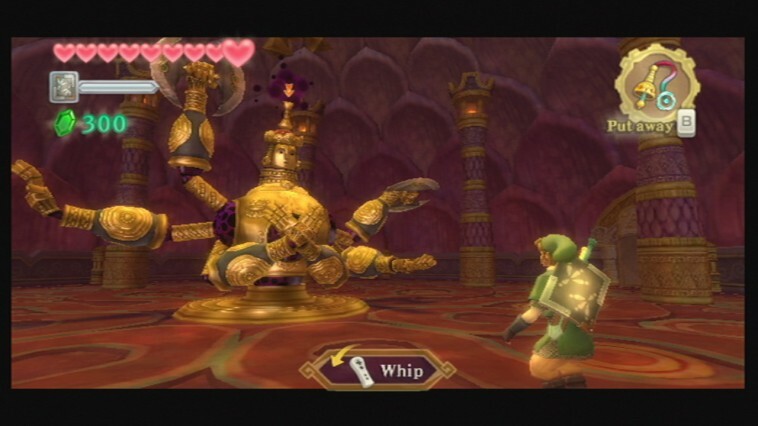 Swordplay ultimately has a large role to play in The Legend of Zelda: Skyward Sword, the intuitive nature and accuracy of the Wii Remote Plus proving the perfect tool for players to feel more engaged than ever before. During combat, the result of every nuance you make with the controller is clearly visible on-screen with Link able to perform thrusts as well as horizontal, vertical and diagonal slashes to tackle his foes. Link’s spin-attack returns, and knocking an enemy onto their back also results in an opening where the player may thrust the Wii Remote Plus and Nunchuk downwards to cause Link to leap into the air to then plunge his sword into the enemies chest with a final blow. Raising the controller above your head also sees Link thrust the sword to the heavens, charging up the Goddess Sword with power that may then be flung forwards as a circular projectile. The Nunchuk itself is also used to employ the use of your shield, an upward movement allowing Link to block or deflect incoming attacks. Nintendo has taken great care to ensure that everything feels as tight and responsive as you’d expect, and it’s most certainly paid off. This is a consistent benchmark for motion control that, whilst a blinding indication of what many have failed to achieve with the Wii, remains to outpace efforts by competitor platforms. This is enhanced further by fantastic enemy AI that’ll see players find themselves continually challenged to outmanoeuvre their opponents. Your foes will attempt to thwart your attacks by tracking and blocking directions that you choose to attack from, so each combat situation turns into a puzzle in itself as you must carefully consider which angle grants the best opening to catch the enemy off-guard. Such quality also shines throughout the item inventory that Link builds on his quest. New equipment such as the Beetle sees you steer by tilting the Wii Remote Plus, whereas classics such as the Bow have new-found accuracy, whereas Bombs are also able to throw with an overhead flick or bowled through an underarm throw. A new introduction to Link’s skill set is the ‘Dashing’ ability, which is utilised by holding down the A button and allows Link to not only run faster but also to briefly run up a wall to reach a lever or ledge to climb along, for example. This is something that you will unquestionably use throughout the entirety of the game, yet may only be used in bursts with the player required to keep an eye on a Stamina Gauge. Let it deplete and Link will tire, unable to move at a normal pace or even lift his sword, although green Stamina Fruits on the ground may be used to immediately refill it. 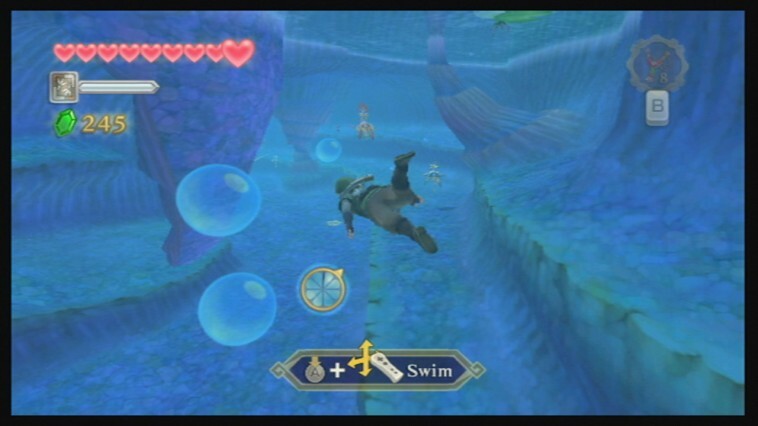 Another addition is Dowsing mode, granted to Link by Fi, the spirit of the Goddess Sword, which aids the player in locating objective items or collectables such as Goddess Cubes, or even bugs, later in the game. With the mode activated, the player moves an on-screen pointer as they search their surroundings, listening out for the beep to reach its peak to indicate the correct direction to hunt in. On paper, it may sound insignificant, but you’ll soon notice its necessity. For those requiring more significant guidance, Sheikah Stones – previously seen in The Legend of Zelda: Ocarina of Time 3D – also return, providing short videos that provide hints as to where the player should travel to next, help solving puzzles, or aid in locating items to complete side quests. You will often find yourself returning to the Bazaar on Skyloft throughout your quest, namely as it has every shop you require housed under a single roof. Most notably is the Scrap Shop, at which you are able to use materials gathered on your travels to upgrade certain items within your inventory, including the Beetle, Bow or varying types of Shields. Providing the necessary materials will allow you to enhance the speed or durability of your equipment, or even to enhance them – an example being the Slingshot, which may be upgraded to a Scattershot that causes a single seed to be spread across a wider area. Likewise, you are also able to use insects that you’ve collected with the Bug Net to infuse your potions at the Potion Shop, elongating and strengthening their effects. A Day/Night cycle is also implemented, although only limited to when you’re on Skyloft and whose alternation must be triggered manually by catching forty winks on any bed that you stumble across. Its purpose is more so for sidequests involving shop owners from the Bazaar, in which you’ll find many a hilarious circumstance surrounding the trials and tribulations of their everyday lives. The entire game is resoundingly glorified through the inclusion of an orchestral soundtrack; soaring melodies and delicate themes adding to the grandiose nature of Link’s latest adventure. Most notably, playfully strumming the Harp that you receive partway through the game is a joy to behold, if not as well-implemented a musical instrument as that seen in previous titles. I believed that I’d become accustomed to the spectacle of Nintendo’s developmental craftsmanship, but I can’t quite remember the last game that, at times, quite literally took my breath away. A masterpiece in both game design and narrative, The Legend of Zelda: Skyward Sword resonates as a radiant beacon of brilliance. Even able to surpass the impeccably high standard that Nintendo set for themselves on the Wii through both Super Mario Galaxy releases, and challenging even the very best of titles within this entire generation of consoles. Barraging players with a tireless array of surprises, this is an adventure that Wii owners will most certainly want to embark upon.